When I was a teenager, my father overheard me complaining about the hypocrisy of certain members of the church our family attended. He said to me, "Mike, you must understand that hypocrites are honest people. They really do feel both ways about the same thing." It was many years and much encounter with my own internal contradictions before I understood what he meant. We are complex creatures, we humans, the more so for coming to consciousness in a culture with its own deep ambiguities and contradictions. Not the least of these is our scrambled messages about sexuality. We come from our maker hard-wired asexual beings. Yet that hard-wiring is culturally circumscribed by barbed wire and land mines, from wise prohibitions about unequal power relationships to ancient taboos from a time when women were considered property. Yes, this is about the Rev. Ted Haggard. I do not know what he did or didn't do. That is, in fact, none of my business. Still, my heart goes out to him. The culture has set a trap. We are not -- ministers especially -- permitted to be who we are in all our complexity. We are compelled to play a game of "Let's pretend." Rather than my father's idea of feeling both ways about the same thing, we must pretend to embrace one and demonize the other. If we do not loudly condemn the hidden shadow part, we might be suspected of entertaining it. It is not acceptable to entertain both and then choose one, thereafter accepting responsibility for the choice, and for the consequences. No. One must be right, the other wrong. And the wrong must be condemned. And so the internal conflict festers, distorting everything related to it. Haggard is undoubtedly a gifted man. It is simply too easy to dismiss and condemn him as a hypocrite like the teenager my father overheard would have. 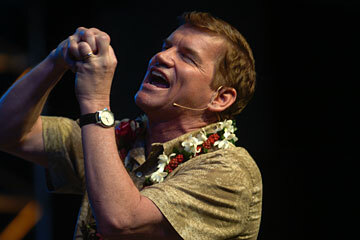 Evangelist Ted Haggard gave the keynote address at the Honolulu 2005 conference at the Hawai'i Convention Center, with 5,000 people in attendance. The pastor of the New Life Church in Colorado Springs, Colo., has since resigned from his post after admitting to allegations by a gay prostitute. Too many gifted men and women in our culture have found themselves trapped in the same closet he was in. We will reap the full benefit of those gifts only when we have escaped turning the "both/ands" of human complexity into moralistic "either/ors." What, exactly, would we have him repent of? Being human and succumbing to the artificial divide that the culture imposes? Being human and succumbing to the felt necessity of condemning a part of himself? Yes, he should not have exploited the cultural blindness that his own being rebelled at. But that was a seduction of power, not of sexuality. His sin, if such it was, was not sexual. It was the very human sin of not being able to contain the vicious trap the culture imposed upon him and, trapped, to have acted out in the pursuit of personal power and national attention. I have performed the marriage ceremonies for many gays and lesbians who have experienced the culture's condemnation and who know firsthand that painful, distorting split between appearance and reality. And I have good friends who chose one path and have had to deal with the pain of broken relationships when they could no longer sustain the culture's imposed deception. May the reverend be redeemed. And may we finally outgrow the notion that there is only one way to be gloriously and joyously human. Maybe then we will be able to celebrate the wonderful diversity of the human spirit in all its curious and fascinating complexity. The Rev. Mike Young is minister of the First Unitarian Church, a Unitarian Universalist Welcoming Congregation.